A pipe milling end prep tool for beveling water wall boiler tubes at biomass processing facilities in preparation for precision welding repairs is being introduced by Esco Tool of Holliston, Massachusetts. The Esco Wart MILLHOG® is a boiler tube beveling machine that features a rigid I.D. clamping system and uses TiN (titanium nitride) coated cutter blades to machine carbon steel or highly alloyed tubes without cutting fluids. Capable of beveling, facing, and boring simultaneously, tooling changes are simple for machining water boiler tubes from 2” to 3” O.D. Rigidly attaching to the tube with clamps that fit into I.D. 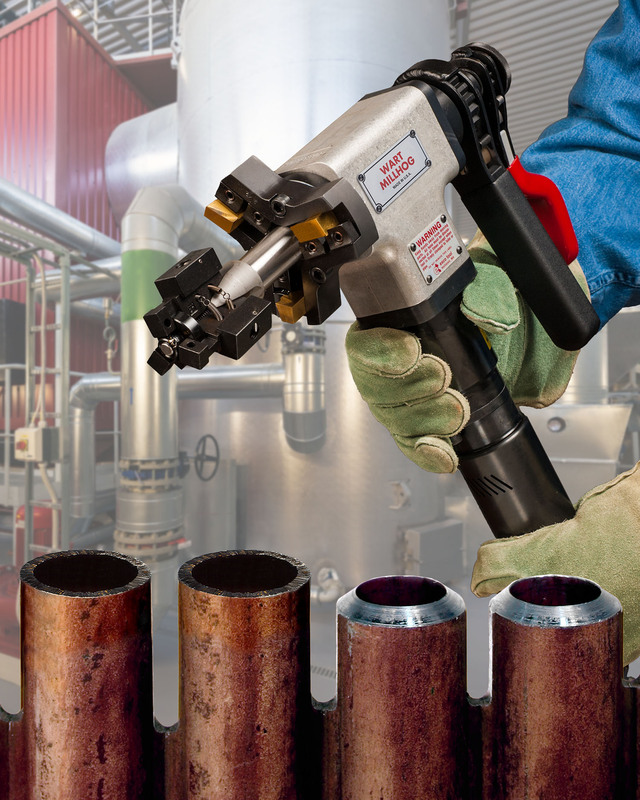 and expand on the mandrel using a self-centering draw rod assembly and attached wrenches, the Esco Wart MILLHOG® boiler tube beveling machine is sealed to prevent debris from entering the tool. Designed with highly reliable dual opposed taper roller bearings, it is offered with pneumatic and electric motors. The Esco Wart MILLHOG® is priced from $5,795.00 and is available for rent.